I said one time that the Purrs’ music loves you. And it does love you, it really does. It’s the kind of love that just makes you feel really good. 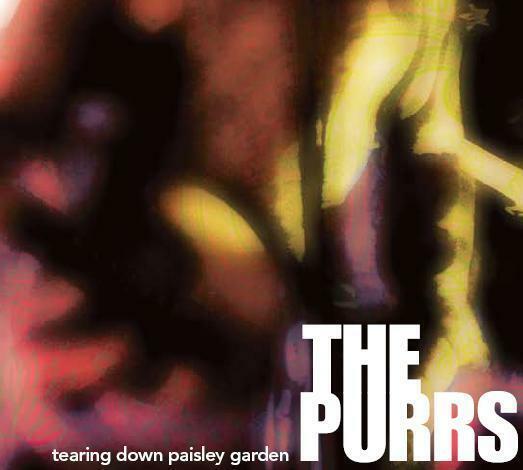 The band’s 2010 release, Tearing Down Paisley Garden, marks ten years of the Purrs as a fantastic band, a quartet who have maintained their integral ambience and strength. Tearing Down Paisley Garden brings in the swarming psychedelic circles in its guitars for a dreamy set of seven songs. “Just a Little More” (who are you to bring me down?) and “Only Dreaming” especially recall a genuine respect for and ability in this genre. Stepping past the psychedelic stamp – because I just don’t know if the band is tired of this classification or not – “It Could Be So Wonderful” (my favorite) verges into spectacular Stone Roses territory, and “Pie in the Sky,” with its title track lyrics manages to fire up a room (I never feel good/no matter how many clothes I buy). The Purrs are distinctive, no matter how I want to make comparisons just so I can give you an idea of what they sound like. I know them when I hear them; I happily recognize singer Jima’s voice and how the guitars join in their emotions. Congratulations to the Purrs for remaining a Seattle wonder. Written by: Dagmar on 12/16/2010.on 12/15/2010. This entry was tagged posted by dagmar, The Purrs. Bookmark the permalink.